WOOHOO! You’re here! Which means you know you need some help to embody excellence in the final area of your life that needs attention: your mindset around your body and food choices. And you know you deserve to feel the way you want to. EPIC!! Welcome to the woman you desire to be! I believe it’s every woman’s birthright to wake up with Vitality every day! Imagine feeling confident in your skin, with the freedom to live your life in a way that makes you feel freaking phenomenal! To throw on your favourite outfit, give yourself a once over in the mirror, say ‘Yeah, looking good girl! !’ and then breeze out the door..
..but you're on a constant cycle of eating well for a couple of days, then falling off the wagon big time, and you are done, because you are not reflecting who you are in other aspects of your life. No more excuses. 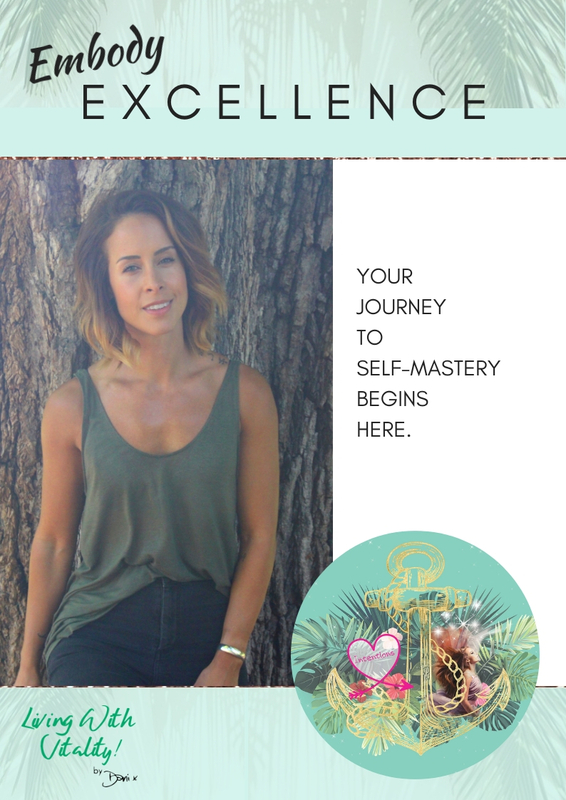 And so I created this guide: 13 Questions To Embody Excellence. This guide creates your vision of the woman you want to be, to get excited for what’s possible as you make decisions from an empowered place; the change you’ve been working so hard for becomes easy and fun! By implementing these questions, you will start to call out your self-sabotage and make choices that align with everything you want for yourself. Look at the action you take in your life, your career and the results you continually create. Imagine the results you'd get if you applied this to your health too! This motivator was finding a beautiful CrossFit community and a new lifestyle was born. The woman that achieved greatness in her sport found her balance of eating well, exercising because she loved feeling the strength in her body and enjoying life to the max with social occasions, full of joy. Dani found that because there was a purpose to living with Vitality, she was no longer restricting, berating and dieting because her mindset had done a 180. The ethos and mantra Dani lived by was 'I choose to feel good' and everything became simplified. Fuelled by wanting to know more about why die-hard habits become so engrained in our programming; Dani trained in the area of NLP and Time Line Therapy ® to facilitate women's journeys' to peel back the layers to reveal who they always were deep down at their core. By inspiring women to Live With Vitality so they love what they see in the mirror, Dani steps well away from any kind of food plan or diet. Instead, she has created a system that connects your desires and intentions to make the very best choices for yourself, full of freedom to live your life on your terms. Welcome to thriving in every area of your life as you ignite the woman you were born to be with embodied excellence!